Guess what time of year it is friends...it's SANTA TIME! If you remember my post from almost exactly a year ago, I talked alllll about our Santa visit in 2014. 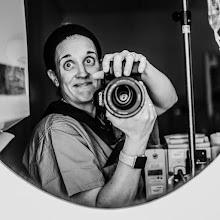 Welp, the time has come again for me to hatch out a lovely blog post once again. Excited, aren't you?!! 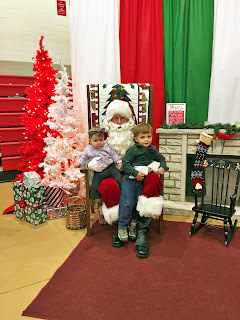 First off, I want to add that we had breakfast with Santa this past Saturday at my school. Despite oodles of tears from a certain hangry 2.5 year old (my own fault for waiting to have him eat until we got there), he finally calmed down and we got (see above!) 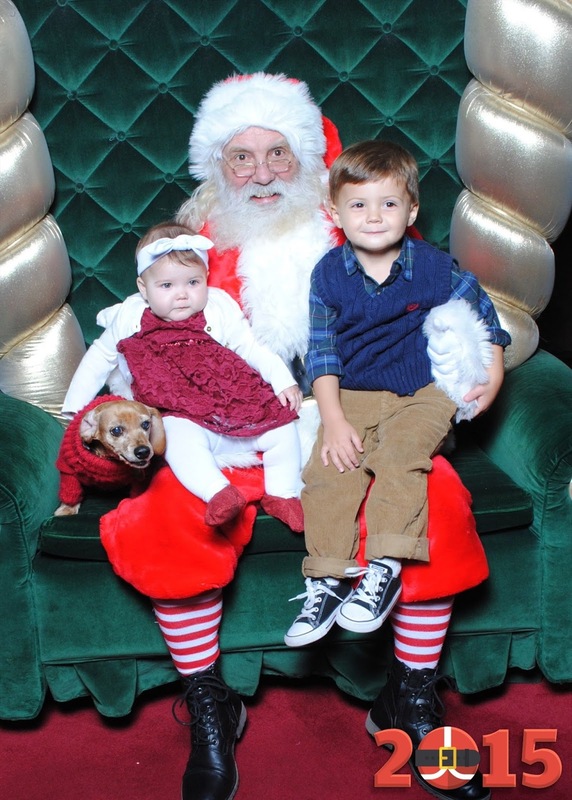 a semi-decent picture of both kids with Santa. Alas, most parents would be satisfied with said shot, but I was not. Why?! Cause my beloved fur baby Scooter was not in it! So! Off to the Monday-night-bring-your-dog-to-see-Santa-at-the-mall we go! 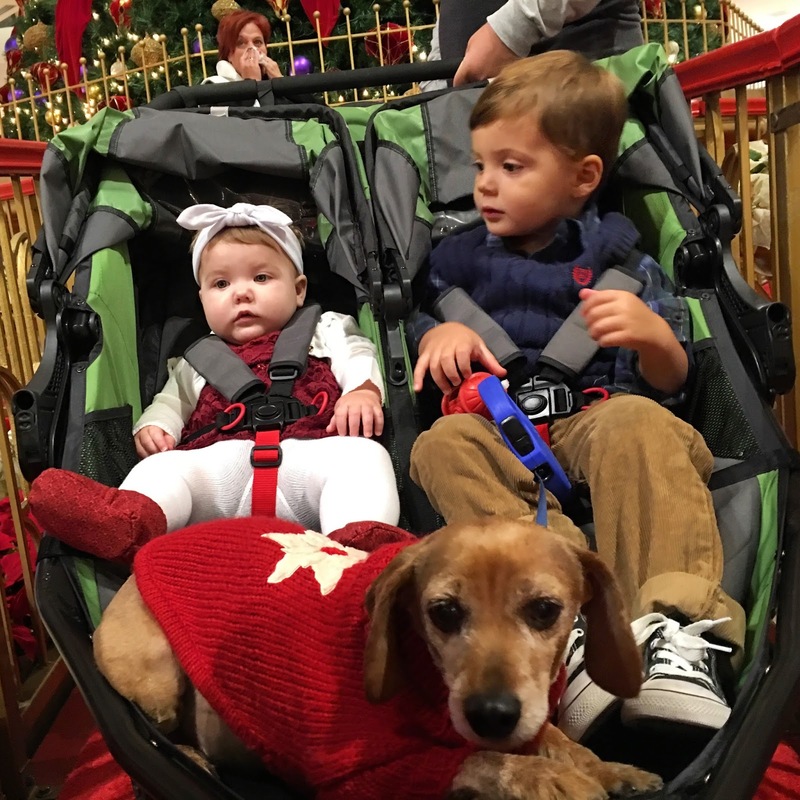 This has become a tradition with us and our good buddies Lauren, Bert, and their pup (and Scooter's BFF) Braxton for the past several years, so we decided to saddle up the fur and real children once again and head to the mall! This year we were in for a treat -- you could make reservations (and save $5 off your photo purchase!) if you reserved your Santa-meeting time online. Um, DUH. And DONE. We'd usually arrive at 5:30 for the 6pm opening of Santa so we could be first and not have to wait in the LONGGGGG line that starts to form a little before 6pm. Well, now we didn't have to! Woot woot! 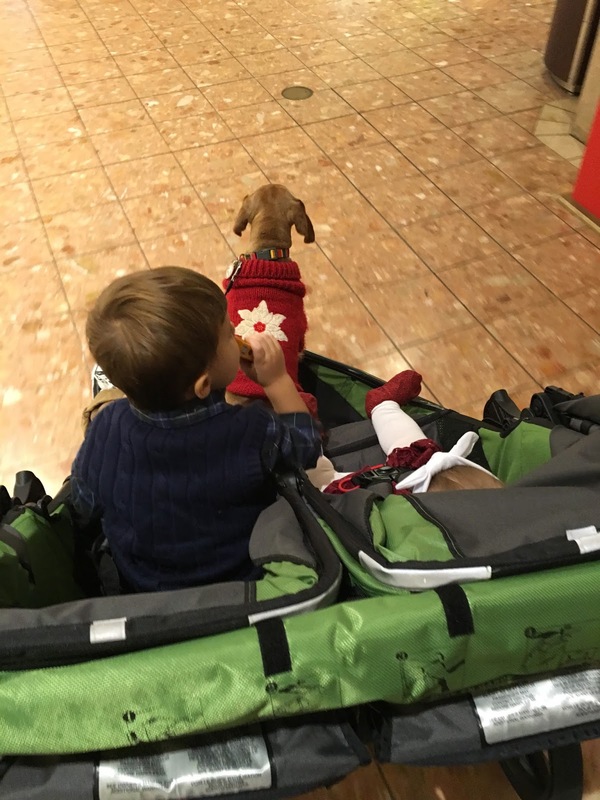 I was excited about this because we could feed Rosie dinner and give Patrick a snack (so they're both nice and happy for meeting Santa) before we arrived. Our reservation was at 6:15, but we arrived (via double stroller with both kids + Scooter) around 6pm and were SHOCKED that there was no one there. Seriously. The last several years it has been PACKED by 6pm, hence why we always got there before 6! But yeah, no one was there! So we were jazzed that we'd get in and out quickly. I totally bribed Patrick the entire way in the car about how if he was good on Santa's lap and smiled he'd get a new train for his Brio set. I also showed him his pics of the past 2 years with Santa to get him excited. Well, I think it worked, because I am oh-so-happy with the results of our Santa pic this year! 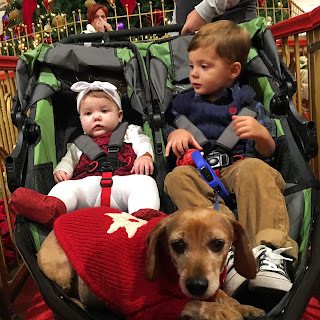 Subtle little smiles all around for the kiddos and even Scooter! Oh! 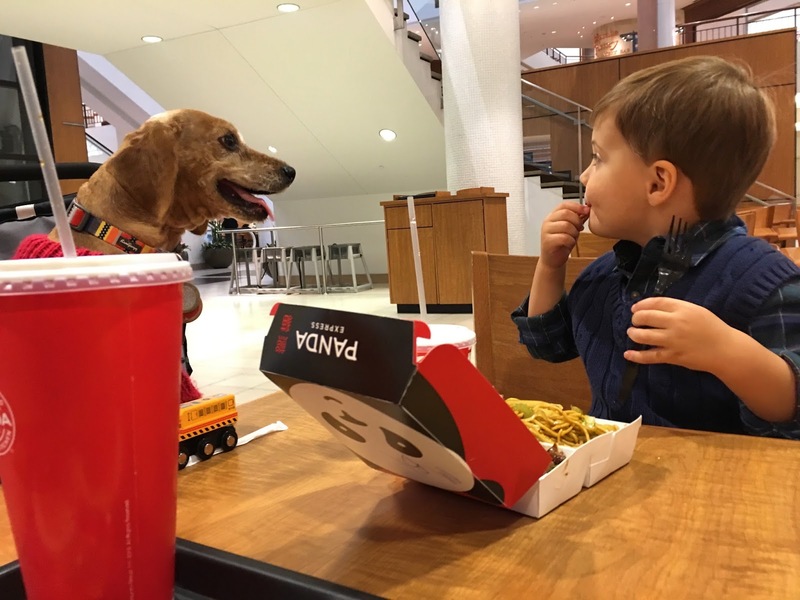 I should also mention that we decided to eat at the mall's food court before we left...and yes, the dogs joined us! Ha! 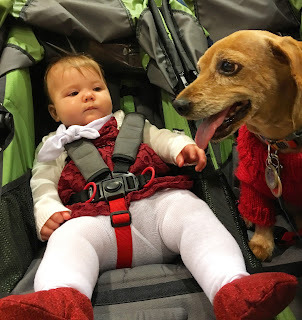 Actually I don't think anyone knew we even had a dog with us because Scooter just sat in the stroller and mean-mugged Patrick for his food, while Rosie mean-mugged them both that she wasn't eating either. Anyways, it was a super fun evening that I'm so glad we are keeping the tradition alive by doing every year, despite how much trickier each year seems to be to pull off :) Ahhhh, life with kids, huh?! I wouldn't change it for the world! The Terrys Came to Town! Coordinating Outfits and Other Fine Things.